Part Two of the Peloponnese wine festival! More indigenous grape varieties and unique terroir including Moschofilero and Vostilidi from Cephalonia! Tasting select wines made of rare, ancient Greek grape varieties. WineScribble meets the winemakers from the Peloponnese in Greece, and important wine personalities based on the island of Cyprus. Enjoy! Hey Tasters! 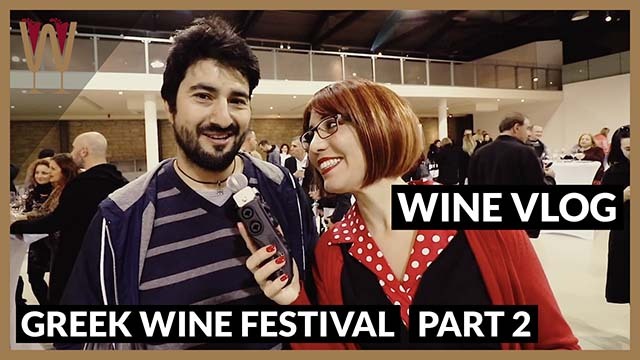 This is the second part of the video from the Peloponnese wine festival. As you recall, I had so much footage I had to make two videos. Enjoy the second half. Welcome to Troupis Winery. Troupis Winery is located in Mantinea, which is in the centre of the Peloponnese. The variety that we cultivate mostly is Moschofilero. Mantinea is a plateau at an altitude of 650 metres. That give Moschofilero the quality, this quality, I mean it has very fresh and fruity flavours. You can see Fteri white which is our entry level Moschofilero. It’s from grapes from growers that we have contracts with. And then we also have Hoof & Lur which is exclusively from our own vineyards. It is also Moschofilero, but it is rosé. That is because Moschofilero is not actually a white variety, it is a pinkish variety, it has some pigments on the skins. So, if you make a maceration, you acquire this colour. I didn’t know that! Yes, actually you can see we have a rosé also, you can see the colour in this on because the bottle is dark. But the rosé has the colour of Moschofilero that you take without adding anything and with some maceration. You can taste Fteri white which you have in your glass. You can see that this very characteristic aroma of rose. Maybe some basil, and you can also smell some citrus. The vintage is 2017, which was to my opinion a legendary vintage for Mantinea, and that is why, although there is almost a year past since this harvest, a year and a half, you can still see this freshness that it has. This is made exclusively by our own vineyard, 50% of this wine is, it comes from the maceration of ten days, we ferment the skins with the must so as to take this flavour and the colour you see. And the rest is one day pre-fermentation maceration, and then it is fermented in ceramic containers. This is lovely! You can also see the rose petals in this style wine. But, you can also smell some other flavours like quince. It’s a very zesty wine, and this reminds me of walking under a lemon tree when it is in full bloom. If you don’t know what I’m talking about you should travel to Greece and find out. This is Petros Akonitis. Petros is an expert in all Cypriot and all Greek wine. Petro, what’s your favourite Greek grape variety? Okay, we try a lot of interesting Greek varieties today. Agiorgitiko I think is the most interesting, the most friendly for me. I love Agiorgitiko because it has a lot of, a lot of faces in the glass. You can try a smooth Agiorgitiko, a full-body and full of tannins Agiorgitiko. Also, a rosé Agiorgitiko. And we are waiting for a white Agiorgitiko with blanc-de-noir technique. We are waiting. Well, that would be exciting. Yes! Thank you very much. Thanks you Petros. Let’ start by talking about Cephalonia, a beloved island, which bears the joyful honour of representing three of the most fundamental varieties of Greece. Rovola of Cephalonia, Mavrodafni of Cephalonia, and Moscato. We as a winery started out about 27 years ago. We started out as a family business, cultivating the family vineyards. Gradually, we embraced organic farming first, and later on biodynamic farming. What are we going to taste today? We will try a very special wine called Vostilidi, in the style concept we mentioned earlier, that os natural vinification, without any sulphites at all. It’s a very rich colour! Yes, it’s an oxidising vinification, without any sulphites. Vostilidi is an oxidative variety with lots of phenols. And this is the result of a vinification in a wooden tank, where it remains for a year on the lees until it is time to bottle it. Vostilidi. Vostilidi: The aromatics of this wine? I would say that in this expression of vinification and bottle ageing there are some aromas of honeycomb, honey and dried fruit. You are absolutely right, it’s honey and dried fruit. Just to close the presentation of this wine, I would mention that this is a wine that ever since we showed it to the market, we had fanatical enemies and fanatical champions. This is the surest sign that this wine is a masterpiece. I thank you for your time. This is Mateo, you know him from whineontherocks.com, one of the best wine blogs on the island of Cyprus. And if you are not following him, follow him right now on every social media. And I just have one question for Mateo, Mateo of all the wines that you have tried here today, which one was your favourite grape variety? Okay, first of all this was not the original question. The original question was ‘favourite Greek variety’ and I have a different answer for that. But, since we edited the question, now I’m going to give you the answer to that question. So, I will have to say Moschofilero. I call it, my wife actually complains that I call it baby Gewürz, because I think it has a profile of a Gewürztraminer. But, in a more baby, toned down, characteristic, which is something I really like. And, I’ve had some really good samples here today and I think of all the grapes I’ve tried, in general, I think Moschofilero was the one that impressed me the most. The rose petal, the loukoumi, the Turkish Delight, the citrus aromas, I mean it is something very very tasty, and I think great for the summer here in Cyprus. That was the perfect answer and because I don’t want you to walk away thinking I changed the question, if you had to choose any grape variety from all of Greece, which on is your favourite, Mateo? White is Assyrtiko from Santorini, it’s an obvious answer but I think, I mean, it’s world class. It ages well, it’s great for the summer here in Cyprus, the acidity, the salinity, the minerality. And, if I had to say a red, I’m a sucker for lighter-bodied, kind of savoury grapes, so I would say Xinomavro from Naoussa. It has that profile of a Nebbiolo, a Pinot Noir from Burgundy. So, I think I would go with those two if I had to talk about Greek varieties in general. I think Mateo and I need to taste wine together a lot more often than we do! I am Dominic Brun, I am from the winery Giannikos. We are located in Corinth in, on the Peloponnese. We are an organic winery, and we do only single-varietal wines. I would love to give you our little fox. It’s 100% Cabernet Sauvignon. It was for 12 months in French oak barrels. It’s the winner of AWC Vienna gold medal in 2016, and best of class in Germany, Austria and Switzerland. So this is a lovely colour. I can see it is dark, but also sort of magenta rim. Yeah, it is a dark ruby red colour, typical for the cabernet sauvignon. This tastes amazing guys! It’s very very, it’s fruity, the tannins are not aggressive at all, they are very well rounded, very easy to drink, very enjoyable wine. Yeah, it is. It is a 2013 vintage, so it has had years in the bottle also, so everything went smooth. I think it one of our best wines. I like that you enjoy it. Here in Cyprus, I would pair it with a very nice lamb rack, fresh from the grill, you know, that has some fats that, it’s going very well with that kind of wines. There you go guys, lamb would go really well with this, I would say some beef would go really well with this. And, I would actually enjoy this on it’s own with some really tasty mature cheese as well, because it is a really really easy going wine. It’s spend five years, six years in oak, it’s naughty years are behind it, it’s all smooth and lovely now. And very well behaved. Thank you very much. Cheers! Hey guys, I’ve had an amazing time here at the Peloponnese festival. I’ve been introduced to grape varieties I never knew before. I’ve met wine makers, I’ve met wine lovers. If you’ve enjoyed this video, leave me a thumbs up. Subscribe! Share this video with a friend.